The pilot community on Instagram has grown 5 times bigger since the app launched in 2010. It is a favorite platform among photography enthusiasts, creative brands, and influencers who want to share experiences in creative and visually appealing ways. 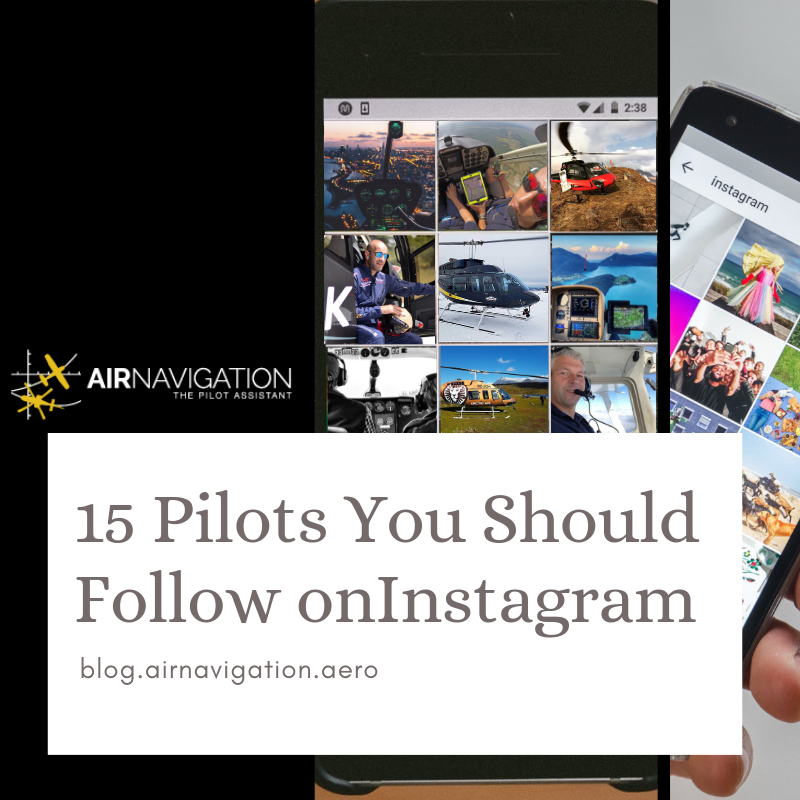 If you aren’t on Instagram yet, here are some really awesome pilot accounts you should follow. You’ll be surprised how the aviation community has gathered such a strong following, some garnering up to millions of followers. Are you ready to take an Instagram stroll with us? A Helicopter pilot based in Stavanger, Norway. His photos are always filled with contrasting hues and bold natural colors. His photos will take you to different adventures around Norway where you’ll see him lift heavy loads with his helicopter or landing on the ice caps of Norway’s mountains. A jam-packed instagram account of everything about Aviation, from a-z. This profile is owned by a U.S retired military pilot and features tons of content from different pilots. A seaplane pilot from the Bahamas, Deon takes Aviation photography into another level. His feed contains photos of seaplanes and anything outdoors that will leave you in awe. An aerobatic pilot and beach lover, you'll love the raw photos taken by Mathilde that features her adventures in the cockpit or on the ground. Borneogeek flies a B744 or an A330 between Asia and the US. His posts are a mix of photos inside the cockpit, aerial shots, crew life including a sample of his cabin meal like the photo below. You also need to watch out for this guy's hilarious post status too! If you like sarcasm and witty one-liners, you'd like to follow this dude right here. For the long-haul crew member, yes, lovely Chinese meals in complete privacy can occasionally be had at 35,000ft as well as in-flight entertainment for those who consider staring at a wall exciting. Maria, a Swedish full-time 737 airline pilot is indeed "living the dream" as she travels around the world one flight at a time. Every girl who dreams of becoming a pilot are sure to be inspired by her. A First Officer based in Spain, Helen flies the B737-800 in and around Europe. You'll love the details of her photos and the different characters she features during her travels. Aside from cockpit selfies, you'll be able to play guess-what-button-that-is in some of her posts where she features the myriad of buttons in her office space. Trent Palmer is a professional UAV pilot who shoots awesome videos of his flying adventures on board on his Series 5 Kitfox STI which he calls the "Freedom Fox". A picture paints a thousand words but this Brazilian girl's Instagram paints a chic life. Luana flies both helicopter and airplane and has traveled the globe visiting 28 countries. She documents this in her Instagram and Youtube channel where she records her flights using her GoPro. Luana's posts will take you outside the cockpit and into different aspects of her life. From wine tasting in Napa Valley, kayaking in the English Bay, hopping on a hot air balloon ride or taking a helicopter for a spin. On top of that, she's also an Economist, this could very well be the girl of your dreams. Joe is an airline first officer and also owns a Youtube Channel that offers pilot training classes. He answers questions related to “what do I need to do to become a pilot”? His Instagram posts are a fun combination of his experiences in and out of the cockpit, motivational posts and the value of improving one's craft. Watch out for that video of him taking a basic life support refresher course with his buddies. A Red Bull Air Race World Champion. Get front row seats and even cockpit perspectives of this world champion’s flying adventures. Witness all the action as Pete McLeod take over the skies through air racing. Being a Red Bull Air Race Champion, he definitely convinced us how flying could be both a great sport and profession. A 50-year old professional helicopter pilot, flight instructor and examiner based in Greece. If helicopters are your thing, then he's definitely worth a follow. He also shares snippets from the different Air Shows that takes place in Greece. Aline is a helicopter pilot from Brazil who's good at documenting some of the best cockpit views and aerial landscapes. She'll take you on her journey as they fly and land on random beautiful locations. Flightchops boasts 228, 486 subscribers on YouTube giving his followers a bunch of useful flying tips through videos, tutorials and some slices of his personal experiences. Mrbentley_thedog is probably the coolest co-pilot in the world AND he's on instagram ���� You'll have to "put up with" the occational aviation unrelated post though. We studied your blog and found it interesting. We are providing effective Pilot Training at Aviation Coaching Alliance academy. Visit our page for more details.